The name of Claude Debussy (1862- 1918) is associated with arguably the most radical revolution in the 20th century music. Like his great contemporary Richard Wagner Debussy often commissioned huge ensembles, with the aim not to achieve the powerful tutti, but rather to create the finest and fullest silence, to render the sounds and emotional states which he considered to be inaccessible to listeners. The piano and orchestral music are the two main realms of Debussy's art. In the both, he chose suites, miniatures and cycles instead of sonatas and symphonies of the Romantic kind. The program of Debussy's music is also anti-Romantic: characteristically, his plots are not philosophical nor thoroughly worked-out: for him, an off-music source is always an impetus for re-enactment of a certain aura, a poetic atmosphere -- not the letter, but rather the very spirit of the original. Such is The Prelude to the Afternoon of a Faun (1894), based on a poem (eclogue) by Stephan Mallarme (1842-1898), the first orchestral chef-d'oeuvre of Debussy and of the musical Impressionism in general. The mythological plot (the faun daydreaming about the nymphs) is but a pretense to create an atmosphere of the blissful tranquility and pleasure, and of the summer afternoon's heat. One of Debussy's many wonderful orchestral finds here is the faun's leit-timbre -- the low-pitched flute (the piece begins with its solo). Among the Italian composers that emerged between the two world wars, Ottorino Respighi (1879-1936) stands apart. While studying music at the Liceo Musicale in Bologna (1891-1901), Respighi demonstrated the versatility of his musical talent. Later on, he regularly made appearances as a violinist, a violist, a pianist, and a conductor. From 1900 through 1902, he worked as a conductor with the Italian Opera orchestra in St. Petersburg. The five-month study course in composition under the tutorship of Nikolai Rimsky-Korsakov (1901) had a tremendous significance for Respighi, in his own assessment. In 1902, he continued his studies with Max Bruch in Berlin. From 1914 until his death, Respighi successfully taught music at Santa Cecilia Academy in Rome. Respighi's individual idiom is a junction of different eras and styles that as often as not seem to be at odds with each other: the Medieval music, with its cold and ascetic intonations liberated from any emotionality (and, respectively, with the natural diatonic, or so-called modal, modes) vs. the exuberance of colors and the exceptional richness and grandeur of the Impressionistic orchestra; Romantic plots of his symphonic poems vs. the realistically precise delineation of the emotional states. Among Respighi's enormous heritage, looms large a symphonic poem triptych inspired by the imagery of the "eternal city": Fountains of Rome (1917), Pines of Rome (1924) and Roman Festivals (1929). The interpretation of the forms of these works is rather Romantic (a merger of the contrasting movements into a one-movement poemic form permeated with the single development); however, Respighi avoids straightforward schematic copying of the Romantic sonata construction: he is rather more attracted to the tradition of a program suite -- particularly, that of Rimsky-Korsakov's Scheherezade. 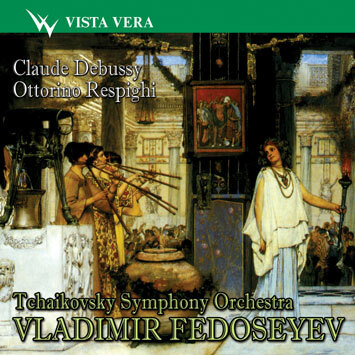 Respighi's orchestral style is quite unique and very sophisticated. It is vividly manifested in both the combinations of timbre-colours, and the diversity of the instruments: in the score of Roman Festivals, besides the regular orchestral set, the composer uses triangles, hand rattles, jungle bells, chime bells, a straw fiddle, wood-boards, a piano, an organ, buccinas, i. e. ancient Roman authentic trumpets that can be replaced with modern ones, and even a mandolin that is playing solo in the third movement's love serenade. Impressive is not only the mastery of the Impressionistic sounding in the silence episodes, but also the powerful culminations, like, for instance, in the second movement of the Roman Festivals, where the triumphant hymn of the pilgrims entering Rome is actually rendered by one C-major triplet, with pentatonic inclusions, that is expanding and finally attaining a barbarian pagan-like force. In the symphonic poem The Fountains of Rome the composer endeavoured to give expression to the sentiments and visions suggested to him by four of Rome's fountains, contemplated at the hour in which their character is most in harmony with the surrounding landscape, or in which their beauty appears most impressive to the observer. The first part of the poem The fountain of Valle Giulia at Dawn, depicts a pastoral landscape: droves of cattle pass and disappear in the fresh damp mists of a roman dawn. A sudden loud and insistent blast of horns above the whole orchestra introduces the second part The Triton Fountain at Morning. It is like a joyous call, summoning troops of naiads and tritons, who come running up, pursuing each other and mingling in a frenzied dance between the jets of water. Next there appears a solemn thane borne on the undulations of the orchestra. It is The Trevi Fountain at Midday. The solemn theme, passing from the wood to the brass instruments, assumes a triumphal character. Trumpets peal: across the radiant surface of the water there passes Neptune's chariot drawn by sea-horses, and followed by a train of sirens and tritons. The procession then vanishes while faint trumpet blasts resound in the distance. The fourth part The Villa Medici Fountain at Sunset is announced by a sad theme which rises above a subdued warbling. It is the nostalgic hour of sunset. The air is full of the sound of tolling bells, birds twittering, leaves rustling. Then all dies peacefully into the silence of the night. The Author's Plan of the Symphonic Poem Roman Festivals. 1. The Stadium. The dark stormy sky hovers heavy over the huge circus, but the crowd is in a festive mood: "Long live Nero!" The iron gate slams shut, the choral singing of the doomed is heard, blended with the roaring of the wild beasts. The crowd is excited, the singing of the martyrs grows louder and louder and, at last, is drowned by the noise of the spectators. 2. The jubilee. The weary pilgrims slowly trudge on, prayers on their lips, up the road to Rome. At last, from top of the Mount Mario, their longing souls and fiery eyes grasp the silhouette of the holy city: "Rome! Rome!" Their emotions are expressed in the triumphant hymn echoed by the tolling of the bells of Rome's churches. 3. The October Feast. The October Feast held in the castles embellished with vine garlands. The hunting sounds, the modulating ringing of the jingle bells and love songs are heard from afar. Then, the trembling sound of a Romantic serenade reverberates in the soft twilight. 4. The Feast of Baptism. The baptismal night in Navo Square. Typical trumpet blares dominate over the crowd's wild noise, among which are audible different musical images that come out and pass, in sequence: melodic peasant songs, saltarella rhythms, barrel-organ sounds, a voice of the travelling-show announcer, the drunkard's hoarse singing - and the repetitive call, full of self-respect and articulating the nation's proud spirit: "Step aside! We are the Romans!"